I hadn't bargained on getting a police raid along with my Chinese foot massage this week, but there I was, just at the point of relaxation, when the cops busted in and demanded to see everyone's ID cards. It upset the serenity, so to speak, but it was the most entertainment I've ever had packed into an hour for 42 yuan. One officer sat down on a pink footstool to chat with the customer alongside me, while the other one strode up and down shouting 'Fangsong! Fangsong!' (Relax! Relax!). It was a great Shanghai moment. Now, perhaps you have foot massages every other week, and are fully au fait with this whole foot massage business, and perhaps I'm the last laowei in Shanghai never to have tried one. But just in case you haven't, here's the lowdown. I can't guarantee yours will be as exciting and action-packed as mine was, but never mind, it's meant to be all about relaxation. Firstly, you can tell a foot massage joint by its tiny size, and the spinning barber pole out front with the refloxology foot map printed on it. From the outside, it looks to be about the size of a broom cupboard, but these places are like the tardis - once inside, you'll find six masseurs and just as many customers reclining on specially made easy chairs. Find a spare one and plonk yourself down on it. The massage menu essentially runs to only four items - reflexology foot massage, body massage, head and scalp massage, and ear massage. Now whether or not you believe that zones on your feet, ears or head respond to body organs or not, it's certainly feels good to have someone pummel your feet for an hour. I am, however, giving the ear massage a big swerve until I can be sure that it doesn't involve some strange Chinese instruments and a follow-up visit to an ENT surgeon. The big, hot, steaming foot bucket comes next. The masseuse tips the contents of a fragrant sachet of powder into the water, turning it a disgusting shade of home brew, but I plunge my cold feet in, and it's so hot I get a piercing pain in my toes. After a good soak, she asks if I'd like the optional extra - for an extra 30 yuan you can have all the dead skin scraped off the bottom of your feet, and all your toenails and cuticles trimmed. This could be kind of gross if it wasn't so damn gratifying to see the small mountain of dead skin on the towel under your feet. The laoban works away with immense concentration, then shouts 'Ah-hah!!" and proudly holds up my previously dry and wrinkled hoof to show me that it now looks like a baby's bottom - smooth and pink. It's a miracle! Now the real work begins and the masseuse, over the next hour, massages every bit of my feet and lower legs until I'm practically asleep. 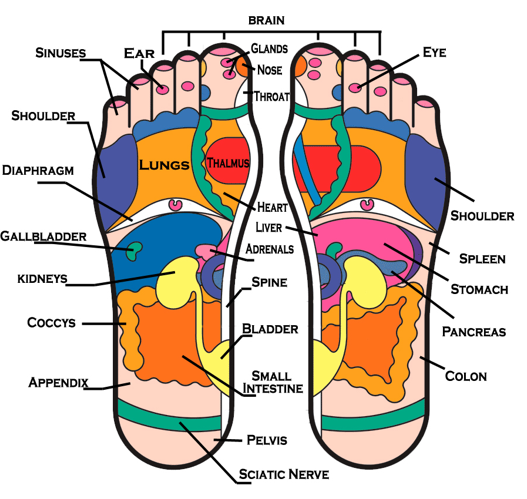 I notice that when she massages the tips of my toes it really, really hurts, and I wonder what part of the body this corresponds to, but their foot/body map is entirely in Chinese. 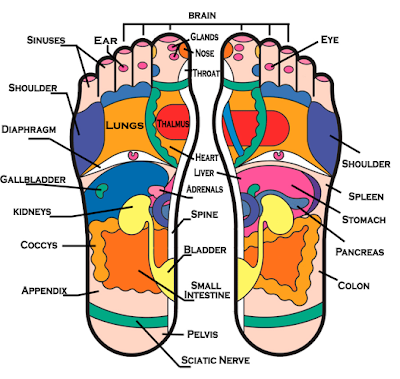 As I'm reading up on reflexology later at home I take a good look at the foot map in English to see which part of body is defective. Oh. That would be my brain.